I’ve had the distinct pleasure of visiting Qatar and the UAE, twice in the past year and was pleasantly surprised by the research and development being done to create accessible and livable Urban districts like Msheireb in Doha and Masdar City. This is far from the perception of a land with no fresh water where golf courses, lush green lawns and fountains are rampant. A new City is being developed (20 minutes from Abu Dhabi) to eventually house 90,000 people and technology is being used in a radically different way to achieve Carbon neutrality at an urban scale. Masdar City is also a great example of preservation of landscape, resources and is the largest lab for experiments in renewable energy. The City welcomes clean energy companies and others to come and form partnerships for performance based testing of their technologies and products. This is a City of the Future, a “Green, carbon neutral City” that follows the 10 principles of “One Planet Living” as developed by IRENA to promote sustainabe practices. The City once completed will be completely fossil fuel free with zero waste and zero carbon emissions. The initial one million square feet will be completed this year and will house 40,000 people along with the Research Institute. Phase B will have 800 students at the Research Institute from 300 and more focus on developing Masdar as a Commercial Sector. Masdar will eventually have 500 apartments, hotels, hospitals, a data center and the Research Institute will also expand. 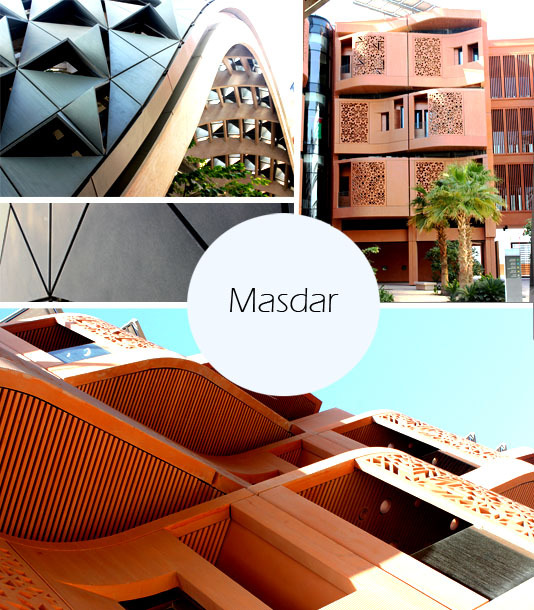 Masdar city has the first university completely dedicated to research on environmental sustainability. The institute provides theory that is developed and tested in the field with pilot projects to optimize engineering and find the optimal solution that can be commercialized at a large scale. Purpose of the research is to meet supply with demand, produce energy in a sustainable way and continual research helps to produce more energy and better the systems. Research is also being done to encourage locally sourced materials, reuse and divert building waste (there’s a recycling center within the site, which has facilitated 95% diversion from landfills in the past 4 years of construction). Buildings as designed use a lot of Passive techniques in order to minimize most of the cooling energy demands. The buildings are closer together and replicate the vernacular layout of an old Arab town seen in the souq Architecture in Bahrain or Qatar and the Deira neighborhood of Dubai. Old Arab cities had narrow, walkable streets, where buildings shaded each other. 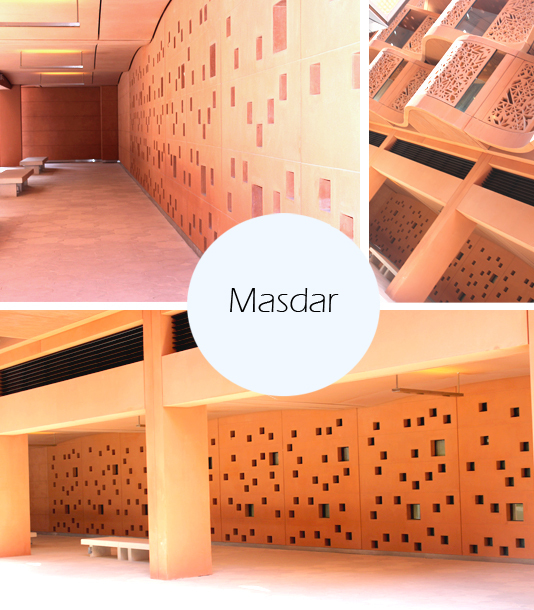 Masdar has a North-East orientation to reduce exposure to Sun and achieve maximum shade. The closer layout along with the roof top PV panels create shade. The city has been oriented to capture prevailing winds for a cooling effect, a fact very evident when you walk in the city, which is 50 degrees Fahrenheit cooler than the rest of Abu Dhabi. Overall layout optimizes ventilation and building mass along with roof slope encourages air flow. Public parks and connecting water features also evaporate and cool surrounding areas. Norman Foster has designed the first round of buildings which utilize terracotta as the material, double glazed glass and thick insulation. Teflon pillows with compressed air are used for insulation and buildings’ energy demand is managed with occupancy sensors that are completely monitored and metered to reduce energy consumption by 50%. The buildings are also equipped with C02 sensors. The city has been carefully planned to reduce energy consumption and emissions through design, reuse and excess consumer and construction waste is of course, recycled. Wood pallets are used as mulch for landscape and recycled aggregate is used as a sub base for roads. All metal used in construction has 85% recycled content and scrap is taken off site for recycling; plastics are also recycled to make furniture. A Smart grid monitors appliances for consumption that results in 56% less energy and 80% less water than comparable buildings. The town center has a 147 feet high wind tower which is designed after the traditional wind towers of vernacular architecture. The tower has louvers on top that open in the direction of the wind and pass it down to be cooled by water misting before being released out. 100% of electricity is produced on site, solar, geothermal and waste is used to generate energy. Clean energy is being created with several PV systems including a 10 megawatt photovoltaic panels’ system, installed over 54 acres to generate 17,000 megawatt hours/year (the system can support a large community or a small city). The plant was used to convey power to Abu Dhabi, when the buildings were under construction and excess is still sent to Abu Dhabi’s national grid. 10 megawatts of energy is delivered to the buildings from this system, which use about 2-3 megawatt with 1 megawatt coming from the roof top PV panels.There is also a 100 megawatt system being developed in the desert which will be connected back to the grid. As an experiment an optical tower plant has also been designed that concentrates sunlight toward mirror arrays that focus and reflect light to the top of the tower. This light is beamed up to secondary mirrors and then beamed down again where the collector is positioned, a process that concentrates the rays like a magnifying glass and produces superheated water to drive a powerful steam turbine, resulting in higher efficiency with greater temperatures. 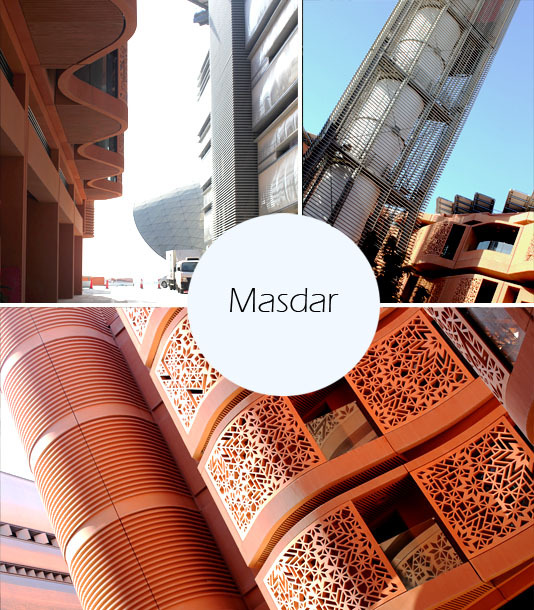 Masdar is designed as pedestrian only with the largest zero-emission transportation system. 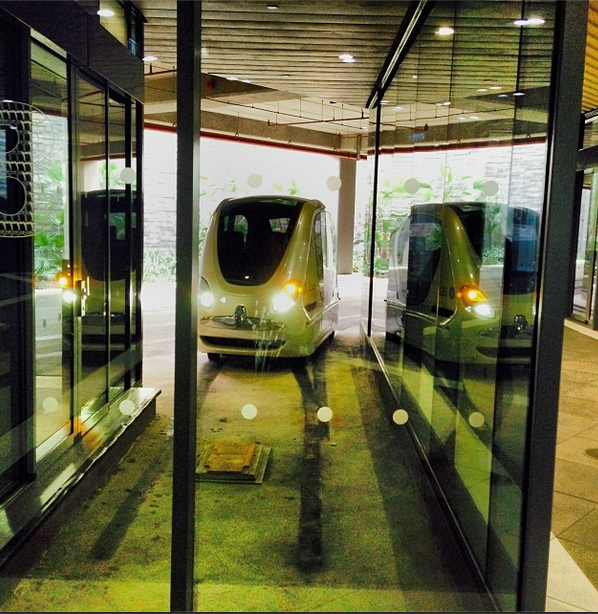 PRTs (Personal Rapid Transportation) are driverless electric vehicles that reduce carbon emissions. Electricity is driven from the Photovoltaic systems instead of fossil fuels. These are charged when parked and can run on normal roads without the need for special infrastructure. The PRTs are managed and kept on track, with a predetermined speed, route and are guided by GPS. Magnets are set in the ground that pull the vehicle back in alignment and the vehicle also has a touch screen inside that allows the passenger to choose a destination (needless to say that I let the PRT determine the destination). These are an ultimate in clean public transportation. The city is cooler because there are no hydrocarbons from cars and the entire town has pedestrian only, visually and thermally comfortable streets. Long term plans include ground level light rail system and a subterranean metro high speed train. As an architect the one disappointing element was seeing Le Corbusier’s famous sporadic window placement from chapel of Notre Dame du Haut, blatantly copied on the ground floor in the buildings (see below). This feature is famously attributed to Corbusier, who implemented small openings on the façade of his iconic building to amplify the light within the chapel. Foster’s office could’ve done better, some of the non-linear historical precedents from local vernacular architecture and culture are more admirable than this. . . .
Masdar is set to be a sustainable city with no skyscrapers or wide highways but instead, will boast well preserved landscape with low-rise buildings, shady streets and everything within walkable distance. The City as a “living lab” is a very successful example of the highest quality of life with lowest environmental impact. HB +A Architects is an interdisciplinary San Francisco Architectural practice involved in design and research that aims to yield innovative, iconic buildings and urban environments. With founder Hafsa Burt serving as design director, the firm today consists of design professionals, who remain committed to the practice of architecture as a collaborative and innovative enterprise. Seeking to build projects worldwide, the firm specializes in Green building beyond LEED certification and Indoor Air Quality, targeting “healthy Buildings”. HB +A Architects is a dynamic and evolving practice that responds to the current social and technological conditions, as a commentary in their work. As a small-sized firm, the firm has the ability to provide hands-on, principal involvement from start to finish.